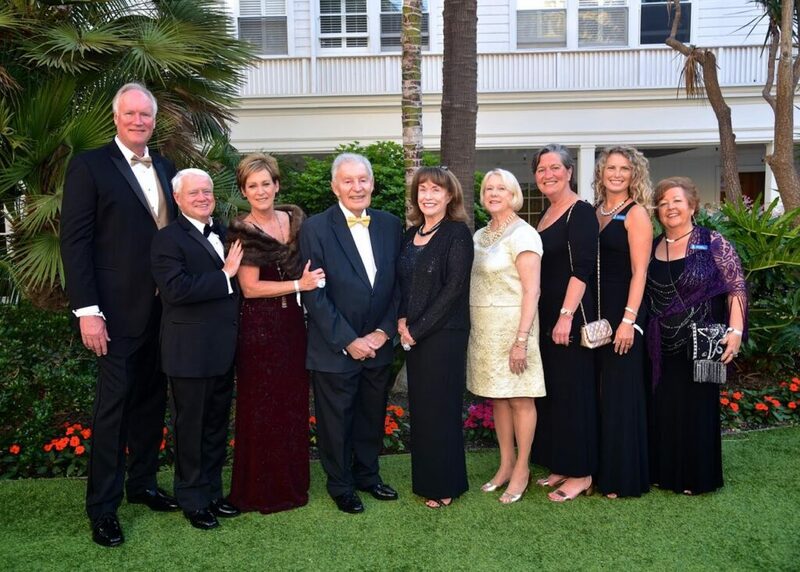 At the Diamonds are Forever Benefit Auction, the past presidents of the Coronado Schools Foundation Board were recognized and honored for their commitment to CSF. Coronado Schools Foundation held their sold out Diamonds are Forever Benefit Auction gala at the Hotel Del Coronado on October 14th. This lavish 007 themed evening featured multiple ways for attendees to support CSF. Additionally, an ongoing online auction began on October 6 and runs through October 23 with over 175 items including products or experiences ranging from beauty, massages, surfing, golfing to shopping, dining experiences, jewelry and much more. Coronado Schools Foundation has contributed greatly to our local community, filling in gaps between schools’ needs and funding capabilities. According to the CSF website, their vision is to have “a public school community that provides students an opportunity to learn, thrive and reach their highest potential today and into their future.” That is vital to our school district here in Coronado, because not all children have the same interests or learn the same way. Through donations made directly to CSF, or raised at events such as the benefit gala, CSF ensures that each school in the Coronado Unified School District has the tools it needs to allow each and every student the ability to achieve their greatest potential. Over the years, many dedicated people have stepped up to the challenge to serve as President of the Board of CSF. Along with the full Board of Directors team, they’ve managed CSF funding and allotments along with disbursing of funds to the CUSD schools. What stands out about the current chairperson and past presidents/chairs is that they are all vested in our wonderful little community in some way or another. Ed Lohlein (1992-1993) has a grandson in a Coronado school. Linda Litrenta, wife of the late Pete Litrenta (1998-1999), was a teacher at Silver Strand Elementary and now has grandchildren in the school system. Chris Searles, M.D., (2014-1015) has three children in the CUSD school system. Jim Grady (2016-2017, 2013-2014), who graciously served seven years as a board member, has a daughter who graduated CHS last year and is currently attending the University of Notre Dame. The complete list of past presidents/chairmen is located on the CSF website. Renee Cavanaugh (2017-2018) took a moment to talk about CSF with me. She has served on the board for four years, and is the current CSF Board Chairperson. Not only does she work with CSF, she is also a teacher at Silver Strand Elementary. “I became involved with CSF when I was hired as a Technology Resource Teacher at Village Elementary. 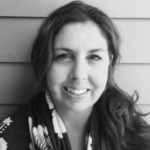 Coronado Schools Foundation funded that position, and I realized how critical those funds were to provide necessary programs for students.” I asked Renee what she would like the community to know about CSF. 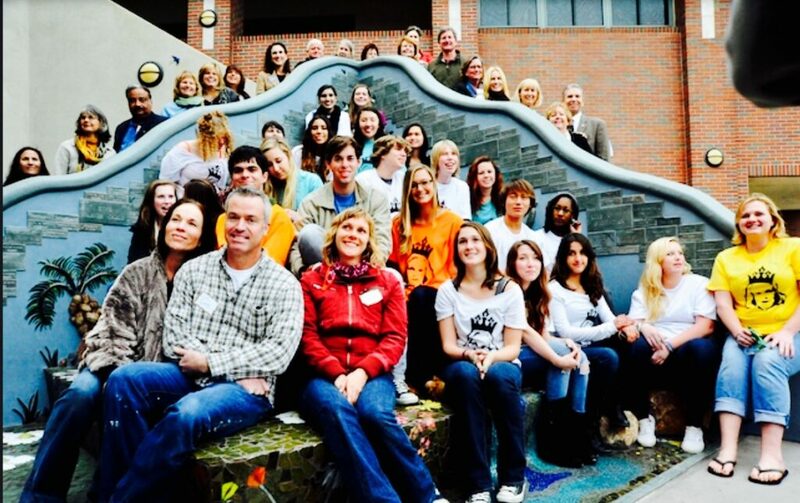 Renee stated that she “would like for the community to know that CSF works closely with the schools to maximize the impact of every dollar that is donated.” She continued to say that since she has been a board member she has noticed an increased interest in enrichment programs and the funding that those programs require. A couple examples of these programs are the elementary level band and coding classes at Coronado Middle School. The River of Giving, Coronado Schools Foundation. Dedicated to honor our most generous and consistent donors, and to inspire others to give vital support for learning that helps our students thrive. 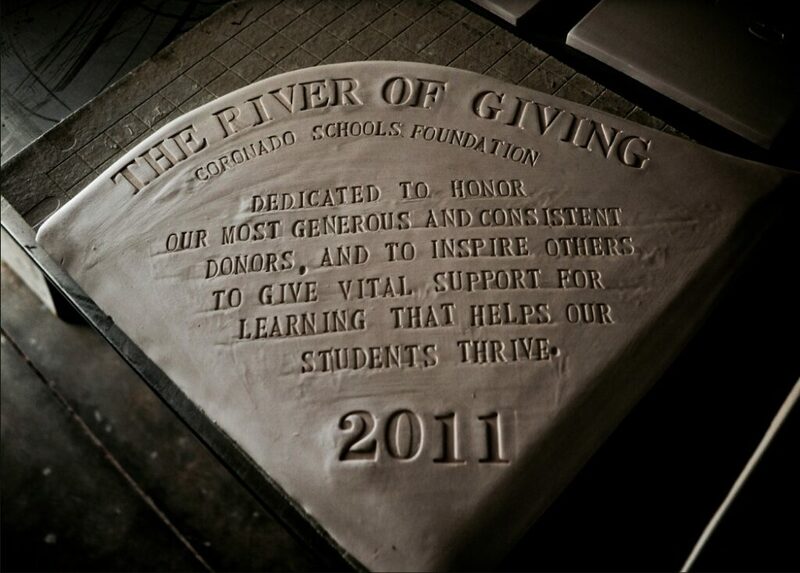 Located in the CHS quad, the River of Giving was created as project-based learning funded by CSF. This picture is during the mosaic dedication ceremony. The River of Giving mosaic project at CHS. 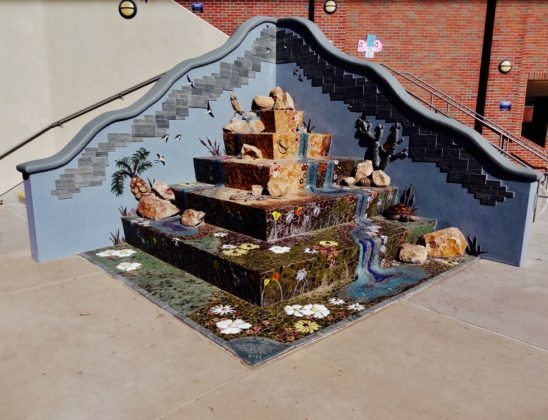 The River of Giving Mosaic project dedication stone.